Solebury Township and the Delaware Canal are forever linked by the approximately 14 miles of the canal that flow along the township’s river border. For more than 100 years during the 19th and early-20th century, much of the township’s economic activity was conducted through the canal. Coal was transported from northern Pennsylvania via the township to Philadelphia, and incidentally coal was supplied to the population near the canal. Stone, lime, and farm produce were moved to Philadelphia markets via the canal. During the 1970s and 1980s National Canal Museum historians and archivists captured the stories and voices of the last active boatmen who worked as young men and women from 1900 to 1932. They worked the same way several generations of boatmen before them did. 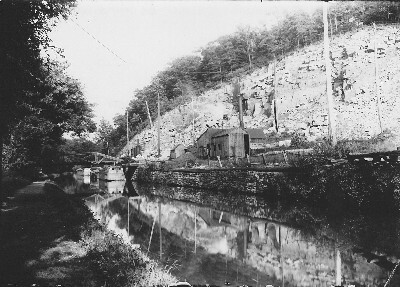 By listening to these first-hand accounts of canal and boating work, we get unique insights into the day-to-day life of Solebury as well as the mechanics of canal boats and the entire transportation system from the mines in Carbon County and nearby Schuylkill County to Easton to Bristol and on to Philadelphia and, by way of the Raritan Canal across from New Hope, to New York City. We thank the National Canal Museum for sharing this history with STHS and the community. There are many ways to interact with this information. Click on a name or the link at the end of each person’s information to see a summary of the interview, the time period discussed, and the tags/key words for that interview. On the summary page, click on the player to listen to the interview. Click on a tag in the right-hand column to see the interviews that contain that key word. Use the search box in the right-hand column to search for a key word. – The two Chamber’s silent films circa 1930 of canal boats, boatmen, and mules. Scenes include mules, aqueducts, locks in action, 1920s automobiles driving along River Road, and the Delaware River in flood. – Grant Emery #1 explains canal boating work and life on the canal, the physical canal structure, the economics of the canal work, and the trail of coal from the mines to Philadelphia. – James Brown #1 reminds us that Pennsylvania Dutch was the canal language, and it tells us of the link to New Jersey’s Morris canal. – Lucy Nace White DeGeorgio’s voice and stories vividly brings to life the tough existence for women and children in the boating life. – George Harven was a photographer who had unique access to the coal mines just after World War II. His stories and photographs of mines and union actions provide a compelling link to coal’s story. – After these introductions, just pick from the host of histories available. All of them shine unique light on the canal’s business and life. Several historians of the National Canal Museum, including Lance Metz, produced this film of former canal boatmen talking about life on the Delaware and Lehigh Canals. The film was funded by an arts grant from the city of Easton, PA, home of the museum. Video and details. These two videos on the canal and its boats and locks from the National Canal Museum in Easton, PA, were shot by William W. Chambers, about whom we know almost nothing. The Museum has graciously shared these with STHS. Video 1 and details. Video 2 and details. Three canal workers, Howard Swope, Leon Dreyer and Ed Dreyer, and Lance Metz, Program Director of the National Canal Museum, were interviewed on a Lehigh Valley radio show in 1981. These same men are on other interviews in the collection. Recording and details. One former canal barge worker interviews four others at a meeting. It is believed this was an effort to spur interest in maintaining the canal for recreational use after its use for transportation was over. Recording and details. Jimmy was one of very few black boatmen on the Pennsylvania and New Jersey canals. He spent almost his entire working life on the boats. Recording 1 and details. Recording 2 and details. Sparky was born in a locktender’s house at Lodi and stated tending the lock at age 10. Recording and details. Lucy completed first grade, and then when her mother died she went to work on a canal boat with her father. After she married Jonas White, they worked together on a canal boat and then as locktenders at Point Pleasant. She tells many tales of life on the canal. Recording 1 and details. Recording 2 and details. Grant Emery was a boatman who worked both the Lehigh and Delaware canals. He learned to swim at age 6 so he could go on the boats with his grandfather, father, and uncles. The National Canal Museum supplied three interviews with Grant that are arbitrarily numbered 1, 2, and 3. Recording 1 and details. Recording 2 and details. Recording 3 and details. 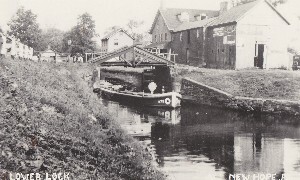 Russell began working at age 7 on the canal with his father. He had very little education because of the work. Recording and details. George was a self-taught photographer who took photos for the Air Force during World War II. He later specialized in pictures of coal mines and miners, many of which are in the Library of Congress. Recording and details. Chester’s roots in Bucks County are deep; his family was involved with the digging of the canal and he lived with his father in the locktender’s house at lock #6. From the age of two on he spent his life in the Yardley area. Recording and details. Harry was born into a family that had boating in its blood, starting with his grandfather. He began working as a boatman in 1924, but his first memories of boating were from the 1890s. At the time of his interview he lived in Upper Black Eddy. Recording and details. Walter May worked as a boat builder and repairer for the canal boats. Recording and details. Julian was a native of Pottsville, PA, who studied mining engineering at Penn State. He began his career shortly after graduation when he accepted a position with the Lehigh Navigation Coal Company (LNCC). (LNCC was mainly involved in anthracite coal mining in the Panther Valley area of Pennsylvania, approximately between Jim Thorp and Pottsville. It was probably a subsidiary of the Lehigh Coal & Navigation Company, the “Company” mentioned in many of the canal tapes on this site. ) Within 13 years he was president of the company and remained until LNCC ceased operations. (This tape is included in the STHS collection under Canal because coal was the reason for the building of the canal that travels through Solebury Township, and the coal business affected all of eastern Pennsylvania.) Recording and details. 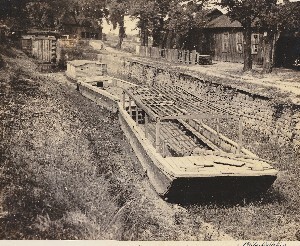 Walter worked on the canal for a few years as a young child. He followed his brothers as mule driver at age 10 but did not make a career of canal work. Recording and details. Madeline was introduced to boating at age 6 by her father, John A. Free. They lived in Erwinna. She was interviewed in two segments by Lance Metz and an unknown companion from the National Canal Museum. The two interviewers, looking for many details, often prompted Madeline with suggestions so it is not easy to know what she remembered and what she was helped to remember, especially of the names of people. What is of good value is her very sharp descriptions of technical boating knowledge, which were gathered while she was just 6 to 11 years old. Recording 1 and details. Recording 2 and details. Anna lived next to the canal near Mt. Eyre road in Washington Crossing from 9-months of age on. In her 89th year she maintained her memories of living near the working canal with its colorful boatmen. Recording and details. These three men were boatmen who shared their knowledge of the Delaware Canal with Lance Metz from the National Canal Museum. We owe a debt of gratitude to Lance, who in 1980 searched out people who worked on the Canal and preserved their memories. Recording and details. Tugboats were used for a short period on the canal. This tugboat captain, whose name is never given, gives information about the tugs and about the canal. Recording and details. Ed began working on the Lehigh Canal in 1919 and occasionally worked on the Delaware Canal. He worked on dredge boats and other maintenance operations until the canal ceased operation in 1942. He continued with the company until 1965. Recording and details. Harry was born in the locktender’s house at lock # 9 in New Hope. He lived in New Hope until 1952 when he moved to Trenton, NJ. Recording and details. 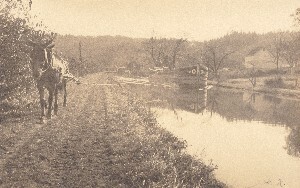 William became a mule driver on the canal at age 9. His family was not into boating and he only worked in the summertime when school was out. Recording and details. More than 20 oral histories done by employees of the National Canal Museum are available only in transcript form because the tapes are missing. In the mid-1990s Lance Metz and Albright (Zip) Zimmerman conducted these interviews to gather first person memories of life along the canal for Mr. Zimmerman’s opus on the Delaware Canal, Pennsylvania’s Delaware Division Canal, Sixty Miles of Euphoria and Frustration. (The book is available from the National Canal Museum.) Three of these interviews are especially focused on Solebury Township and New Hope. All three are of interest for the details of canal life, the coal business, a farm boy’s bucolic life in Solebury, and surprisingly, notes on the first summer (1939) work at New Hope’s Bucks County Playhouse. The originally typed version with Mr. Zimmerman’s notations of these transcripts are used since there does not appear to be a final copy of the transcripts, and as the copies and hand written notes are quite crisp they give an immediate impression. When George was 5 years old, he and his family moved to his grandparent’s farm in Solebury Township on Laurel Road near Centre Bridge and the Delaware Canal. In the 1930s his family moved to the Cuttaloosa area, and the canal was the summer playground of his youth. Transcript and details. Calvin moved to New Hope when he was 3 years old and grew up there in the 1920s and 1930s. After World War II he returned to New Hope, and for the rest of his life lived in a few other places but always moved back to New Hope. He was an architect and involved citizen. Transcript and details. Transcript and details. Jim’s ancestors were among the original English settlers of the area and he was a life-long resident and mayor of New Hope. He shares his extensive knowledge of the area and important issues of the time. Transcript and details. Note: Only a small part of the National Canal Museum collection of oral histories is included on this site. To see the entire list, click oral history interviews or oral history transcriptions (for those whose tapes are lost).